Translation services for the food industry are quite specific and differ from the rest of the professional services because of the broader scope of the industry itself. And when it comes to food equipment translation services, there is a demand for a language service provider (LSP) that has the right knowledge, expertise, experience, and personnel to deal with such a specific matter. The sector is highly regulated and the economic and marketing conditions are extremely sensitive and competitive. So, any new player in the market has to offer an immaculate product in order to be welcomed by the customers. 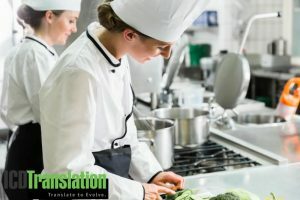 For food equipment manufacturers it means hiring a professional translation agency, experienced in serving the food and beverage industry and providing a wide range of translation and localization services covering critical areas such as labeling, packaging, standardization, and even patent translation. As the US food sector is thriving in the last couple of years, the time is ripe for manufacturers to explore its options and plan their global expansion. To better achieve that, they will need a trusted partner in the face of the right translation agency and a sound plan how to facilitate their market penetration starting with proper preparation for food equipment translation services they need. The food and services industry in the USA is facing a positive trend for 2019 as per the forecast publish by Foodservice Equipment Reports. The unemployment rate is just 3.7%, which is at record lows and wages have grown by 3%, while the inflation is stable at 2.5%. Consumer confidence is also at up at historic levels and is expected to keep up the good trend. All of these factors are positive news for the food equipment manufacturers who are planning to expand their business and enter new territories. The time is right both for foreign manufacturers who want to set foot in the USA market and for the American manufacturers who are target the EU or Asia with their products. When it comes to food equipment, manufacturers who want to enter a new market, need to pay special attention to the translation of the entire range of documentation related to their products. The equipment needs to meet a wide range of requirements in order to be eligible for the new market. In the USA only, NSF International has assisted in the development of more than 75 standards and protocols related to food equipment that can be used in the industry. The standards include requirements concerning the safety, design, construction, and product performance. If you are a foreign manufacturer planning to enter the American market, your products will have to compete with local ones that meet these standards. If you are an American manufacturer exporting equipment, you need to make sure that all of the certifications you have are relevant to the requirements of the target country. In both cases, you will need reliable food equipment translation services that can prove your credibility and provide acceptance for the products and technologies you offer. You need to make sure that the equipment you offer is safe and meets the legal requirements. You also need to make sure that your end customers can easily understand how your product works, how it should be used and/or maintained. Failing to meet the demand of the target consumers and offering a product in a language unfamiliar to them is one of the sure ways to failing your new market penetration. To avoid such a mistake and to take advantage of the positive outlook in the E&S sector, you need to plan your translation project and select the right language service provider. Due to the dynamics of the food industry, you cannot rely on a one-size-fits-all strategy for the growth of your business both domestically and globally. You need to offer localized solutions presented in the language of the target customer both figuratively and literally. According to a research by Common Sense Advisory (CSA), 14 languages were sufficient to reach about 75% of the global internet users in 2017 and the number is expected to grow to 16 by 2022, while you will need to add nearly 40 languages to reach about 90% of the users. The good news is that the translation and localization process is scalable and once you have prepared properly for the inclusion of the first foreign language, it will be even faster and cheaper to add more languages. To facilitate the food equipment translation services provided by your LSP, it is necessary to write your documents with translation in mind. Write in short, concise sentences. Thus, the reader will follow the instructions easier and won’t have to go back and wonder about ambivalent phrases. Use the same construction as this will give conformity and clarity to your document. Use one term to denote a given product or concept to avoid misunderstanding. In technical language it is not necessary to show how rich your vocabulary is and how many synonyms you know. You need to be specific and clear. Thus, you will not confuse the user and you will avoid mistranslation as certain synonyms may have different meaning when translated. Use standard fonts as customized fonts may not be supported in other languages and that will increase the cost of your translation. Allow space for expansion since translated text may take up to 25% more space as is the case in English to Spanish translations, for example. Avoid idioms, slang and too specific cultural references as they are generally not recommended for technical documentation and often cannot be properly translated and localized. Always submit the final version of a document for translation. Make sure that you have proofread your document and corrected all mistakes and that you are satisfied with your text in terms of content, clarity, accuracy prior to sending it to your LSP. Any changes made in the original text, will have to be corrected in the translated versions which may often be a costly and timely undertaking. Following the above-listed tips and ideas will give “good taste” to your food equipment translation services. If you need professional translation for your equipment manuals, specifications, quality standards or safety guidelines, ICD is here to help with a variety of services in any language you need.